As a valued Safeguarding Essentials member, we truly appreciate your recommendation. That's why for just spreading the word, you could earn 25% off membership or your next membership renewal. Earning your discount is easy, simply log into your Safeguarding Essentials account and visit the 'My Account' section where you will find the 'Make a Referral' link. Input the name and email address of the person you wish to introduce. Edit the prepared email if you wish. Your recipient will then receive their own unique discount code, so they get 25% off. Once your friend takes out a subscription we'll apply the discount to your next annual renewal. 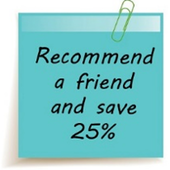 Get started and Recommend a friend now.